Platoon 2 was very busy on its second night with two structure fires of suspicious origin. At 11:15 on Friday night, April 20, 1979, a full assignment was dispatched to Corey's Lumber Co., 2425 Dixwell Avenue, just south of the railroad bridge on the east side where the parking lot for Bruegger's is now. The fire started in the rear and was well involved by the time the first engine arrived. It was under control by midnight, but the building was destroyed. 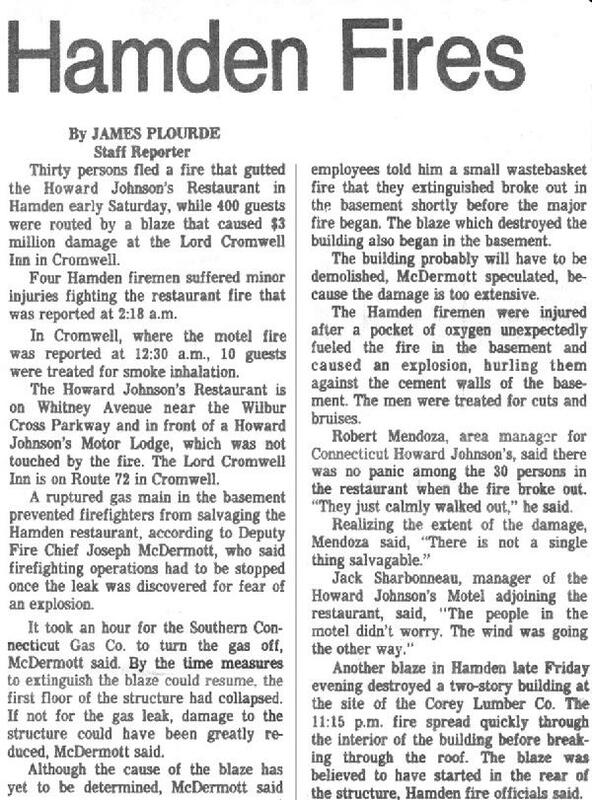 Firefighters were still at the scene when another fire was reported at just after 2 a.m. at the Howard Johnson Restaurant at 2260 Whitney Avenue, where the Hamden Town House stands today. The restaurant suffered extensive damage. Efforts to extingush the blaze were hampered by a broken gas line in the basement and several firefighters sustained minor injuries. The fire at Howard Johnson's was the third time in 18 months that a broken gas line played a major role in the devastation. In October 1977, a broken gas line resulted in an explosion that destroyed an apartment in Whitneyville that killed two occupants. 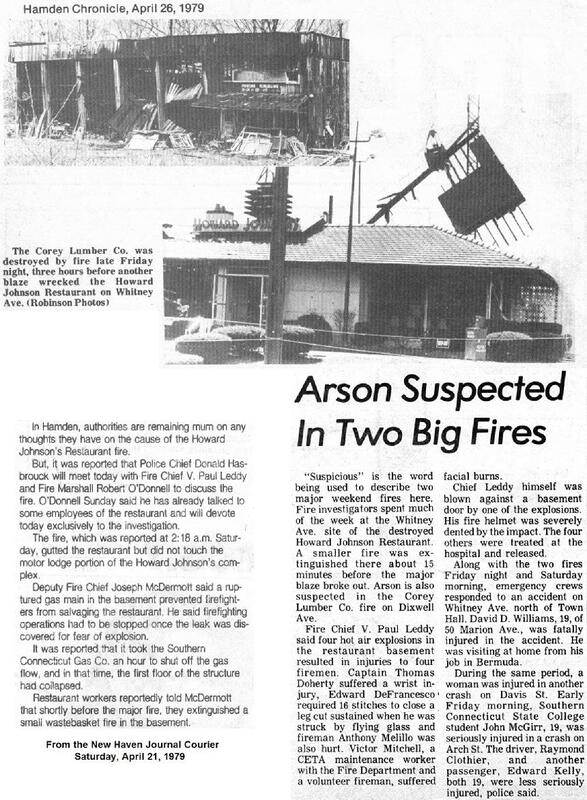 Several months later, in February 1978, a fire at the Daw Packing Co. was fed by a broken gas line in the basement. Subzero temperatures hampered efforts to shut off the gas at the street. The Corey's and Hojo's fires were not the only major emergencies that night. Volunteer Co. 7, filling in at Headquarters during the two fires, was first on the scene of a fatal one-car accident in front of the old Centerville Food Shop on Whitney Avenue, just north of Day Spring Street. This is the site of the Howard Johnson's Restaurant fire of April 21, 1979. Click on the photo to see what the landscape looked like in 1951.